A few weeks back, I posted about my favorite short fiction of 2015. To go along with that post, here are the novels, collections, and anthologies I loved this year. I’m sticking to things published within this year, but there will be an ‘honorable mention’ section at the bottom for non-2015 work. 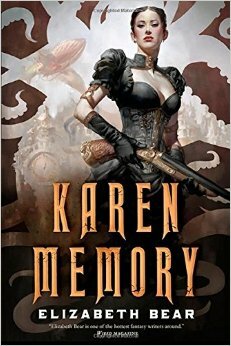 Karen Memory by Elizabeth Bear – I went into further detail about why I loved this book back in March. The short version is, it has a fantastic voice, strong, diverse characters, and it’s just good fun. There’s adventure, daring escapes, and it’s a kissing book full of girl cooties in the best possible way. The story centers on the ‘soiled doves’ of Madame Damnable’s Sewing Parlor, and the lengths they’ll go to in order to protect their own. Wild West with a touch of Steampunk, and as I said, a heck of a lot of fun. Signal to Noise by Silvia Moreno-Garcia – I also blogged about this one back in the spring and again at Fantasy Book Cafe as part of their Women in SFF Month. The story centers on three friends who, as teenagers in the 80s learned to cast spells using vinyl records. The novel also deals with the same three friends in the present day, showing the how their lives have fallen apart somewhat as a result of their magic-using back in the day. Moreno-Garcia takes a light touch with the speculative element, allowing the characters and their relationships to truly shine. Meche, the main character, is particularly striking. She’s angry and authentic in a way few fictional characters – especially women – are allowed to be. At the same time, she’s utterly sympathetic. All around, it’s a beautiful novel, and the final scene of the book is just heartbreakingly lovely. Magonia by Maria Dahvana Headley – I raved about this book back in the summer. Like Signal to Noise, Magonia gives us a female character who is allowed to be prickly and angry and justifiably so. Aza is dying, trapped in a body that’s failing her, while still doing her best to live a normal life. The novel is soaked in gorgeous imagery, and it’s absolutely heart-wrenching at times. Family, and love, and life, but also birds, and flying ships, and all kinds of wonderful things. It’s a brilliant inversion of a portal fantasy, and isn’t afraid to utterly shake up the world as the characters know it. Accessing the Future edited by Djibril al-Ayad and Kathryn Allan – This anthology, put together by the good folks at The Future Fire, features stories putting disability and mental illness front and center. Too often science fiction sweeps disability under the rug. Either there’s a ‘magical cure’ that makes disability a thing of the past, or it’s erased through a simple lack of inclusion. Accessing the Future reflects a world that looks more like our own, and includes disability that isn’t hand-waved away or ignored. There are some truly stand-out stories in this collection, and I particularly enjoyed those by Nicolette Barischoff, Samantha Rich, and A.R. Sanchez. 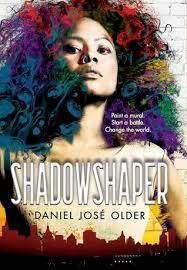 Shadowshaper by Daniel José Older – Magical graffiti, old family secrets, and characters fighting to save their neighborhood, and the world. The speculative element in this one is definitely more overt than in Signal to Noise, but again, it’s the character interactions that truly make this book shine. One thing I particularly appreciated about this as a YA novel is that it doesn’t cut adults out of the picture all together. Sierra and her family don’t always see eye to eye, but they care about each other. The adults don’t automatically dismiss everything the teens and have to say, and vice versa. In the end, it’s multiple generations within the neighborhood who come together to make things right, and that’s something I don’t see often enough in fiction, particularly of the YA/MG variety. She Weeps Each Time You’re Born by Quan Barry – I wrote about this one in October’s Women to Read column. Barry shows readers Vietnam as a country full of ghosts. Rabbit is born in her mother’s grave, and sees spirits no one else can throughout the rest of her life. Barry is a poet, and this is her first novel. The way she uses language let her roots as a poet show, while still being utterly satisfying as prose. This is a beautiful, looping novel, unfolding bits of itself at a time to reveal a stunning whole. Letters to Zell by Camille Griep – I wrote about this one a few months ago. Letters to Zell is a surprisingly effective take on what happens after the ‘happily ever after’ of fairy tales. It’s also a truly touching portrait of strong female friendship, flawed, but unshakable. Griep provides fully satisfying growth arcs for each of her characters over the course of the novel – they grow together as friends, and individually, as human beings. Updraft by Fran Wilde – I blogged about this one a few months ago as well. Updraft is a novel full of stunning world building. Kirit is a fiercely determined character, fighting for the right to speak, fighting for her family and her friends, and negotiating a complicated web of politics and secrets. There are breathtaking descriptions of flight, and the bone cities, towers, and bridges Wilde describe make this one of the most unique secondary world fantasies I’ve seen in a long time. 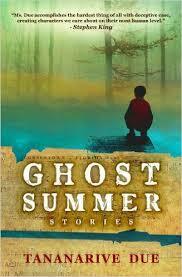 Ghost Summer by Tananarive Due – This is a reprint collection, but most of the stories here were new to me. I highlighted one of the stories in my November Women to Read column, but any one piece from the collection would be worth highlighting, as they’re all very strong. The stories are grouped together by theme or setting – a small Florida town haunted by ghosts and old sorrows, and a post apocalyptic future in the wake of a mysterious disease, among other things. The variety and strength of these stories make this an outstanding collection. Radiance by Catherynne M. Valente – I’d been looking forward to this book all year, and it did not disappoint. As is typical of Valente, this is a novel soaked in style. Elements of it are reminiscent of Jeff VanderMeer’s Ambergris novels, but at the same time, her world(s) are wholly unique and the voice is unquestionably Valente’s. Radiance is art deco punk, alternate history, retro future space travel, just to name a few of its many facets. The novel is ambitious in scope and style, combining documentary film, noir, romance, fairy tale, and radio plays to slowly unfold the tale of a disappeared filmmaker, a young boy who is the sole survivor of his Venusian colony town, and a father who filters his reality through a camera lens. Valente gives us the pieces of a puzzle, each gorgeously rendered, adding more pieces to the box just when we think we have the picture halfway figured out. But it’s never frustrating. Each new element only makes the whole that much more dazzling. Radiance is a novel about stories, about the lies we tell ourselves and each other, about seeing and being seen, about the narratives we use to make sense of the chaos of life. Taken all together, Radiance is a stunning and decadent, horror-sci-fi-fantasy that makes the wide variety of voices, themes, and genres it takes on feel effortless. 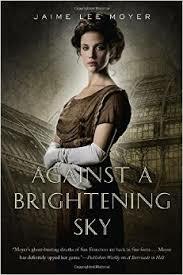 Against a Brightening Sky by Jamie Lee Moyer – A fully satisfying end to a trilogy which started with Delia’s Shadow. Refugees are pouring into America in the wake of the Great War, and bringing their ghosts with them. Delia is more fully in control of her abilities in this book, but she still has dangers and fears to face – fear of failing her friends, of losing those she loves, and being unable to stop the tide of sorrow brought to her doorstop by the dead. As always, the characters shine, including the city of San Francisco itself. Moyer does an excellent job of revealing new depths to Delia, Dora, Gabe, and the rest while introducing new characters, and tying all of their stories into the larger picture of a world putting itself back together in the wake of a devastating war. She Walks in Shadows edited by Silvia Moreno-Garcia and Paula Stiles – This anthology puts women front and center in the Lovecraft mythos, a space where they’ve historically been almost entirely absent, downplayed, and ignored. The stories offer fresh takes on familiar tales, and move beyond the established framework to bring readers something new. Overall, the anthology is strong, but those stories in particular that stood out to me were by E. Catherine Tobler, Gemma Files, Molly Tanzer, and Pandora Hope. As an extra bonus, the stories are all accompanied by fantastic illustrations. 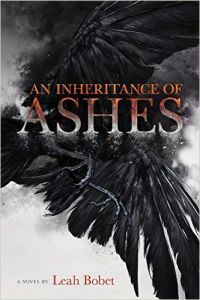 An Inheritance of Ashes by Leah Bobet – This is another novel I’d been looking forward to for a long time, and which did not disappoint. Bobet immerses readers in a world blending weird fiction and dust bowl punk, set in a far future after the fall of existence as we know it. Gods, or what many people call gods, are real, and far stranger than we ever imagined. The story centers on Hallie who is living with her older sister Marthe on the farm they inherited from their father. Marthe’s husband never came home from the war that nearly broke the world, and they are struggling to maintain their independence, put enough food on their table, and keep everything from falling apart. Their relationship is deeply fraught, and Hallie in particular is a beautifully flawed character. Her pride and determination keep her from asking for help, often to her detriment and the detriment of others. At the same time, she is true to herself and what she feels in the moment. She always tries to do the right thing, even when it backfires. The world Bobet paints as a backdrop for these characters is fantastic; twisted bird-spider things, fox-eared lizards, and the island-sized corpse of a beast all leak into the world in the wake of the wicked god who was killed by a vanished hero. Every character has their own strengths and motivations – ones that sometimes keep them from understanding each other, but who are, in the end, fiercely loyal to each other. It’s a novel of family, friendship, discovering yourself, and fighting to save a world. There you have it. There’s a whole (figurative) pile of books I’m already looking forward to for next year. No doubt they will become a literal pile soon enough, spilling from my shelves and end tables, begging me to read them. Those books, however, are for a separate post. What books did you love best in 2015? What did I miss that I need to add to my already in-danger-of-toppling pile? This is what you call a Favs with a strong female and liberal bent. Actually that suggests that it might actually include a minority of books outside of that particular prejudice. Which I don’t mind, Just that you have been chosen to be some type of person who is against sexism by some. Which I never did but you are pushed on us by those, I actually consider you part of Today’s Feminist Sexist Privilege Culture. The kind where part of your living comes from whining about how bad your group has it while demonizing the other.